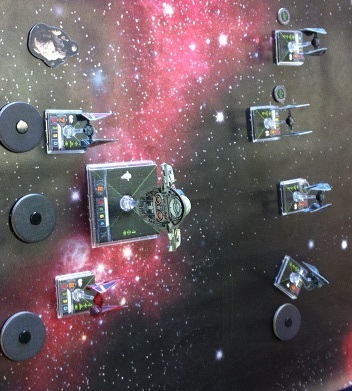 X Wing Minatures Game Bedworth Tournament Report Part 2- The Martin Strikes Back | Blood Shines Gold And All Coin Spends. So Onward to Part 2! 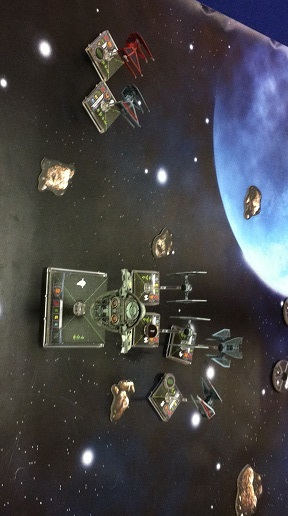 We left our plucky Imperial Heroes (just as they are in Star Wars) 0-2 and -200 down. Not looking good to be honest! The first lose was just a complete kicking, the second was very close and mildly unlucky. However before I say anything further about dice luck I must of course remember the lesson as taught by James of IYGDTTWT: never blame your dice, it’s not an excuse, your bad generaling put you in that situation. This is of course unless you are James, in which case this doesn’t apply and the dice are on some sort of vendetta! So after 2 rounds I was heading down to the fun end of any tournament, the bottom tables. Theme song for both of us: Beck says it all! I don’t have his list specifically, but it had the tricked out Phantom, 2 of the Imperial aces and a regular tie (one of the buffers I think). At last, a match up I liked the look of! As I had higher pilot skill and good firepower I was looking froward to this bottom-table match up, especially as my opponent was rocking the phantom. Then in the setup phase something great happened from my point of view – Lewis started putting asteroids out of the way and to one side. I did the same and we ended up with a nice bit open area to maneuver in! It was clear that this was not going to be the longest game but it would be brutal. With both of us using subtle, maneuvering based lists for some reason we decided to throw that all that aside and run at each other (clearly we’d just adopted the Simon Tams’ ‘push it forwards’ approach) and we learned one thing. If you can’t get shot because you’re invisible, you better make sure you stay as invisible as possible. Finally the heavy laser cannon earnt it’s keep. It was a bloodbath, but as planned by moving later and shooting first I could delete the main threat to me each turn before it did damage. By stopping him doing it in return and catching Echo on a rare visible moment, I finally got on the board with a 100-0 win. Comeback starts here, I thought naively. It seems however the dice gods, or at least the X wing tournament software, has a sense of humour. Game Four vs Martin again! Theme for this one: Shirley Bassey and the Propellerheads or Bonus Song The Heavy – Oh no, Not you again! When the draw for round 4 was announced I couldn’t believe it. Once again I had to face Martin. After getting wiped out in game 2 that put me 0-4 against Martin in the last two weeks alone. However for a pleasant surprise this was slightly different to last time. 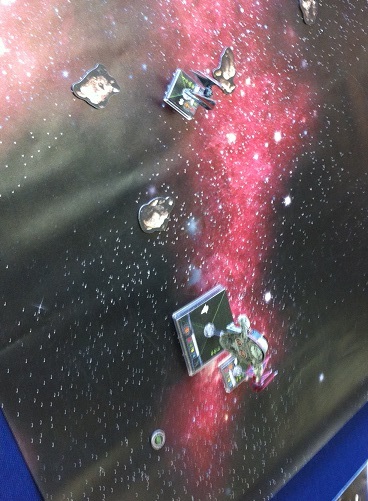 Where the game before was a beautiful demonstration of maneuvering, in the rematch it was like someone had magnetized our ships. There were more crashes that the annual under 5’s destruction derby. As in every other game I lost my grey imperial ace early on (we decided before every game he’d been telling people that he was 1 battle from retirement) but the battle was more even than before. This time at least I drew blood. 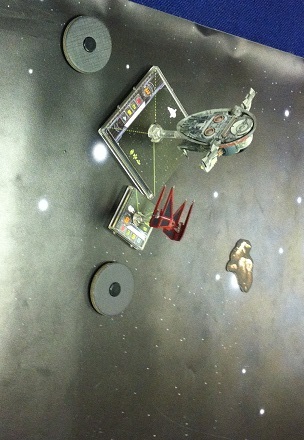 I managed to destroy the Defender though it cost me Bobba and all bar one imperial ace. It came down to my last ship verses his Damaged Fire spray. Despite the best in Imperial bobbing and weaving eventually he got a shot with his Martin’s Own Brand Heavy Laser Cannon(tm) and it was over, along with my comeback. As you can probably guess, he once again celebrated by being incredibly nice and humble. Dammit he drives me crazy! Lesson of the day: you can only dodge for so long. So another fun game to finish the tournament. The main aim from this game was to beat the replacement player (Simon Tams) who was giving his usual, supportive advice in a loud voice from nearby. “Don’t choke” was the summary. Fortunately once again this one went to plan, with the brave imperials blasting the fake imperials off the board for one last final and very satisfying 100-0 victory. So final score 2-3 record, 248 points. So in essence a good tournament, great fun day with superb sporting opponents. I’m now owrking on my list for the next one I attend. My main question: where can i find Martin’s Own Brand Laser cannons(tm)?